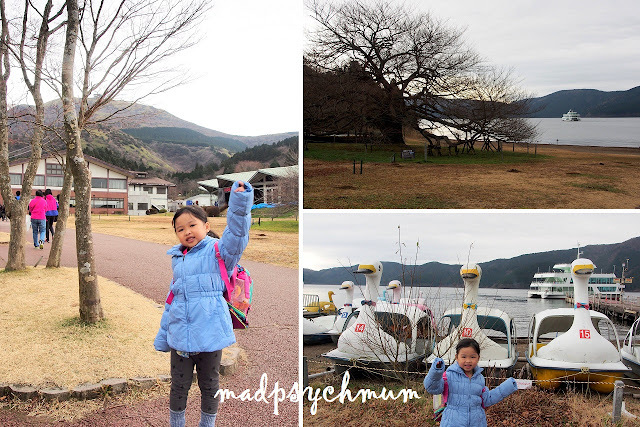 We booked the only available tour to Hakone and Mount Fuji yesterday via our hotel, who informed us that we had to walk to Keio Plaza Hotel to board the tour bus. As we dragged our legs through the long 20-minute walk to the meeting point, I grudgingly commented that we should have stayed at Keio Plaza Hotel like everyone else since we can also save on transport to Disneyland. 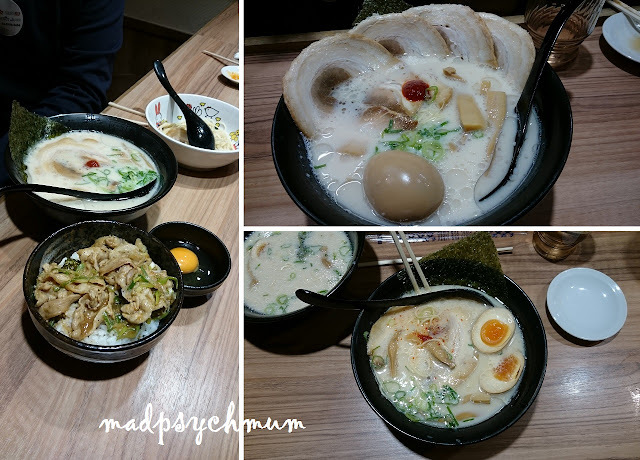 "Would have cost us S$300-400 per night ok," the hubby remarked, "and it's so ulu, not even near to all the shopping." On arrival, we met up with our tour agency (Experience Japan if I'm not wrong) and were led to our bus. Our tour guide was a very friendly Japanese woman who was really passionate about Japan. 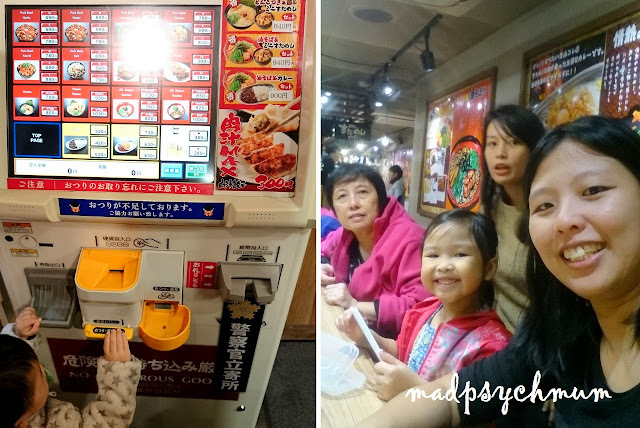 She took her job very seriously and took great pains to explain Japanese culture and customs to us. 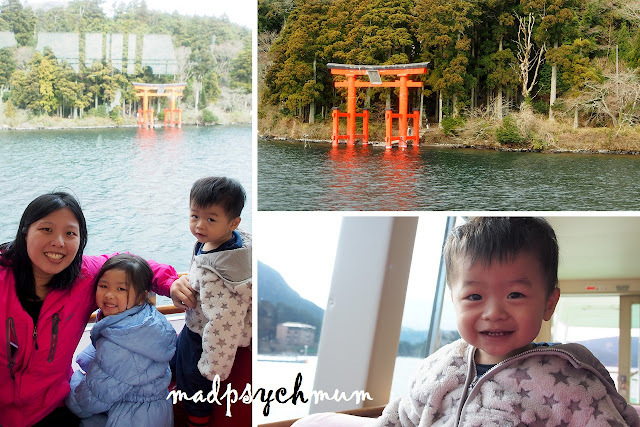 Our journey to Lake Ashi at Hakone took about 1.5 hours (all of us slept soundly on the bus). We didn't pay for my kids (you have a choice whether or not you want to pay for a child under 6 years old) so they weren't supposed to get a seat on the bus. Thankfully the bus was not full so we could occupy the empty seats (otherwise we would have had to carry my kids the whole journey!). 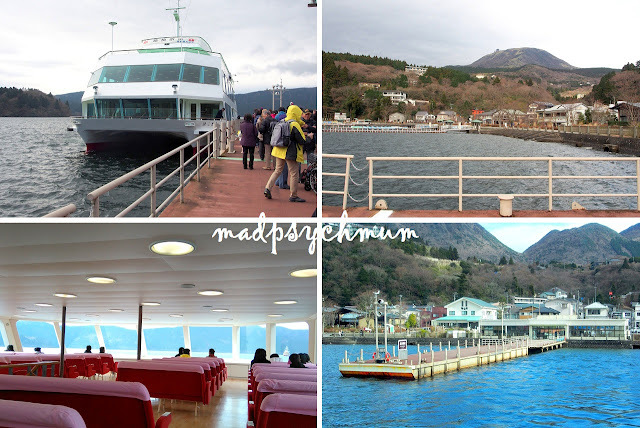 When we finally arrived, we were brought to the dock where a ferry was waiting for us. A very excited Baby Boy knows that we're going on an adventure. We went to the deck of the ferry to experience the amazing view (and the cold) even more. We were not even halfway done with taking our selfies before it was announced that the ferry was about to reach the dock and we were to disembark. "What?! So fast?!" we all complained. The 15 minutes went by too quickly in our opinion. We arrived at a quaint and quiet little town, which also houses the Hakone-en Aquarium. Cute duckie boats lining the shore. We were surposed to have lunch but as it was not ready yet, we spent some time shopping at the small Shopping Plaza. We proceeded to the Japanese Restaurant when lunch was finally ready. This is the full set for each person! So much food! Thank God my girl didn't have a set (because we didn't pay for her tour package) so she could share our food. Pot of rice kept warm on a fire (I don't particularly like eating rice but I love Japanese rice! 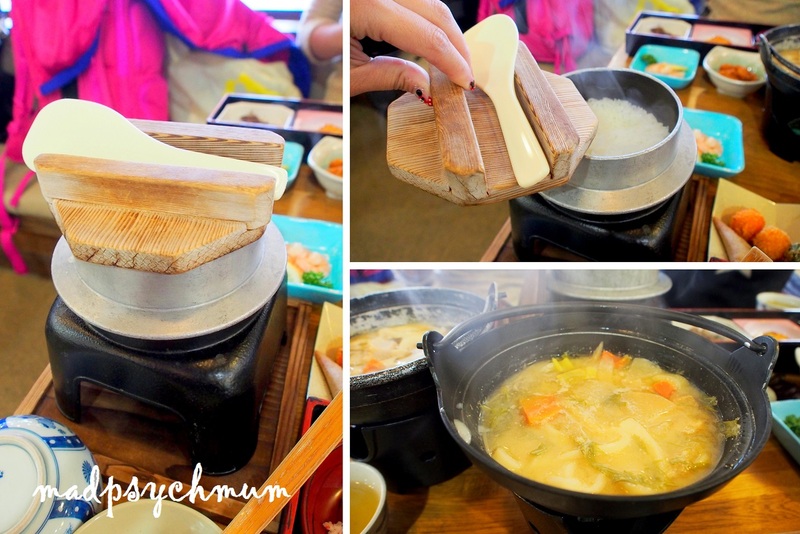 *yum*) and delicious hotpot. After lunch, we were supposed to go on the Komagatake Ropeway, located next to the Japanese Restaurant where we had our lunch. 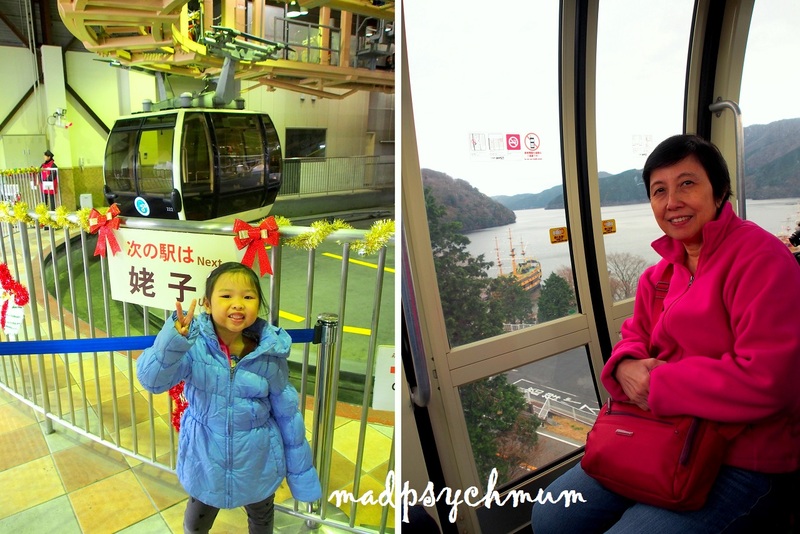 However, as the winds were really strong that day, the ropeway was closed for safety reasons. We were brought instead to another ropeway, Hakone Ropeway, just 10 minutes away. 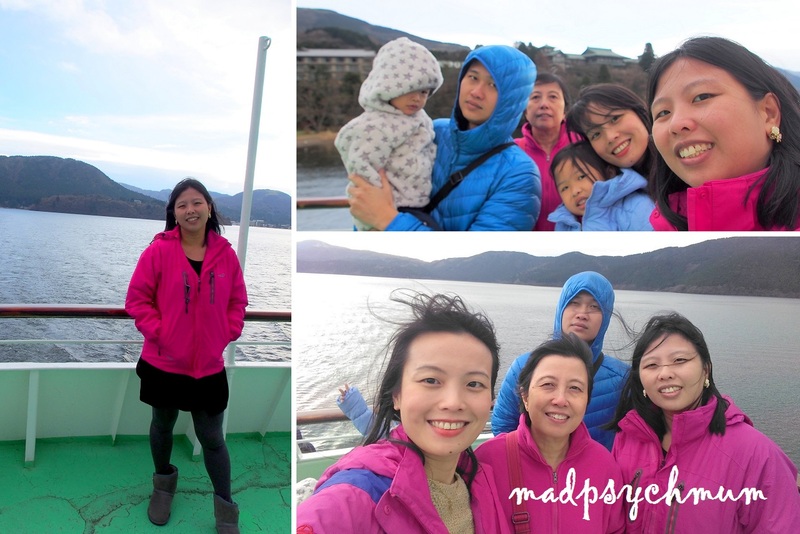 Right: Mum with the view of the Lake Ashi and the mountains in the background. Baby Boy had an awesome time riding the cable car even though the rest of us were less keen. 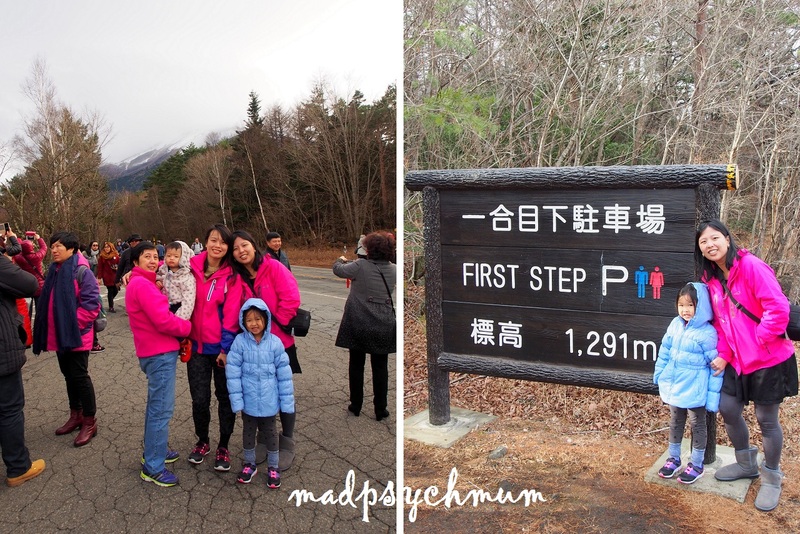 To be honest, I was hoping to see something good when we reached the first station but was really disappointed. The whole ride (up and down) to the first station was about 15-20 minutes but we spent about the same amount of time queuing up. 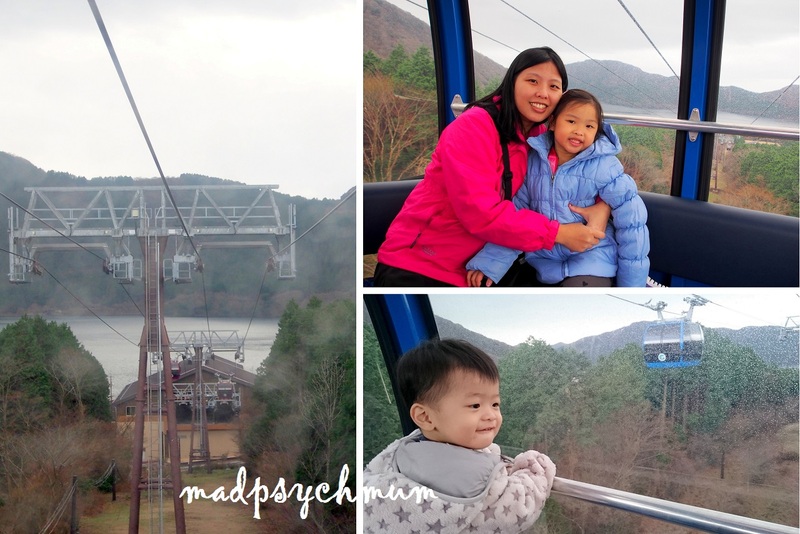 I wouldn't mind it so much if the ride was fun however, it was really boring (definitely not as fun as our experience with the Scenic Cableway rides in Blue Mountain). Hence, if you've got choice, best to give this a miss. 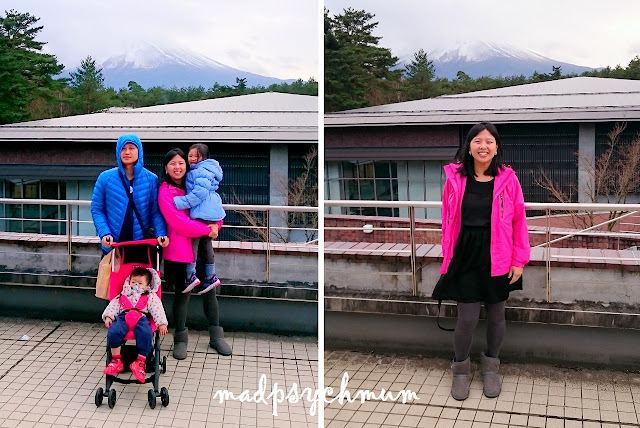 We travelled to our next destination, Mount Fuji, which we managed to get a snapshot of on the way there. According to our tour guide, Mount Fuji is known as a mystery mountain because you can only see it clearly during the winter however, visitors can't visit the highest station (the 5th station) because it is closed for safety reasons (heavy snow and strong winds). You can visit the 5th station during the other seasons (especially summer) but you might not be able to see the mountain (like my photo above) because the peak will be covered with fog. Since we visited at the beginning of winter, all the stations are closed except for the First Station. Don't expect too much though as you can't really see anything from there. The bus also brought us to the Yamanashi Prefectural Fuji Visitor Center where we found a spot on the 3rd Floor that gave us an even better view of Mount Fuji. Signboard on what to do at the Visitor Centre. Love this family photo of us. (although the Pockit Stroller cannot be reclined, my Baby Boy has had no problem sleeping in it). And with that, we came to the end of our tour. 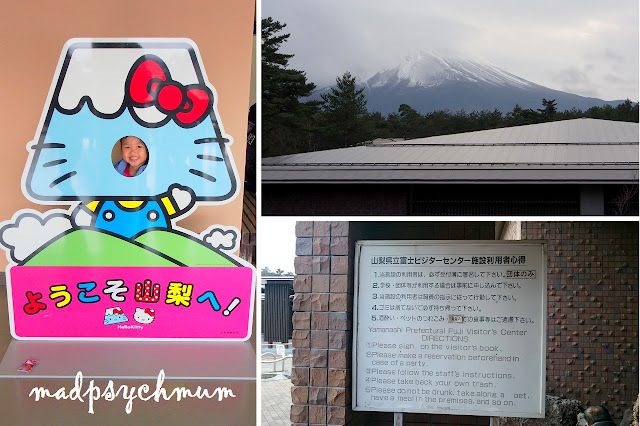 If you've got more time, you should consider visiting Fuji-Q Highland, a themepark near Mount Fuji. We passed it by on our way back and thought it would be so cool to be able to go on rides with Mount Fuji towering in the background. We were told that our journey back to Shinjuku could take any time between 1 to 3 hours depending on the traffic conditions. 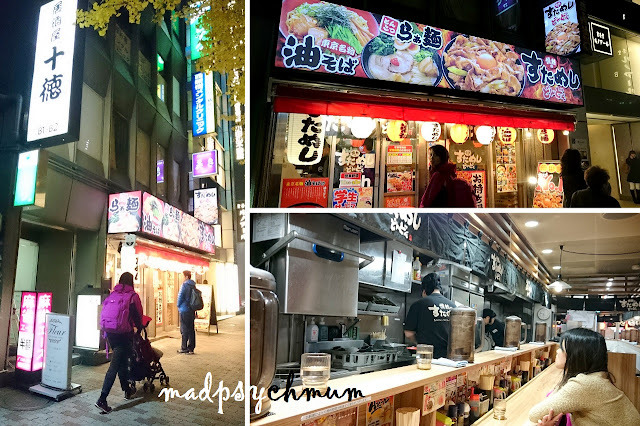 Thankfully it only took us slightly over an hour and and we arrived at Shinjuku just in time for dinner (it's actually not very late but the sky gets dark very early in winter). Right: Selfie at the bar tables. After dinner, we wandered around in Shinjuku and went to our favourite 100 Yen Shop that we shopped at on the first day to see if we missed out anything. The hubby and I finished shopping earlier than the Sister and Mum so we waited for them at the sidewalk. While waiting, I noticed many Japanese walking in and out of a very unassuming building located opposite where we were. I told the hubby that based on my gut feeling (which is usually never wrong), we should go check it out. The hubby looked at the directory and realised that there was a 100 yen store at the 6th Floor. 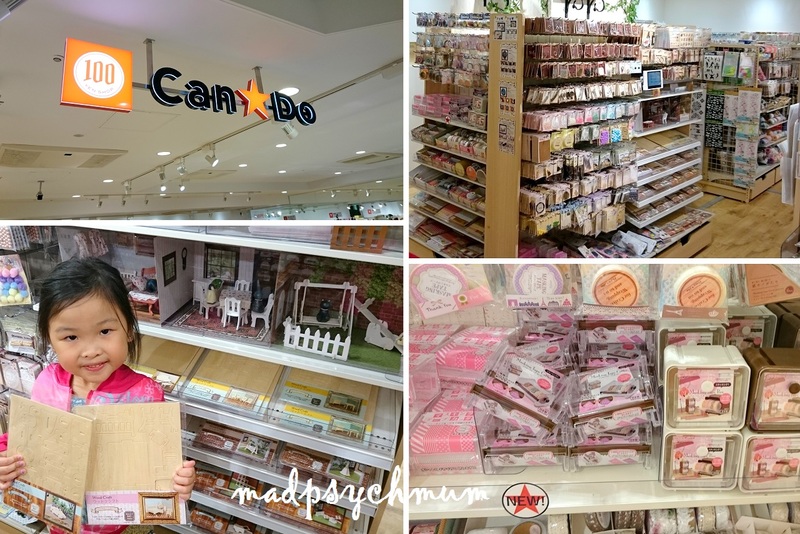 It turned out to be Can Do, a 100 yen store selling all sorts of stuff that were prettier and more artsy than Daiso and the 100 Yen Store! I was literally in heaven! Cut-out wood crafts that are just 100 yen each! Girl got to choose a few to bring home and make. Cheap and good!